Alex Rigotti in Drama on 24 February, 2018. 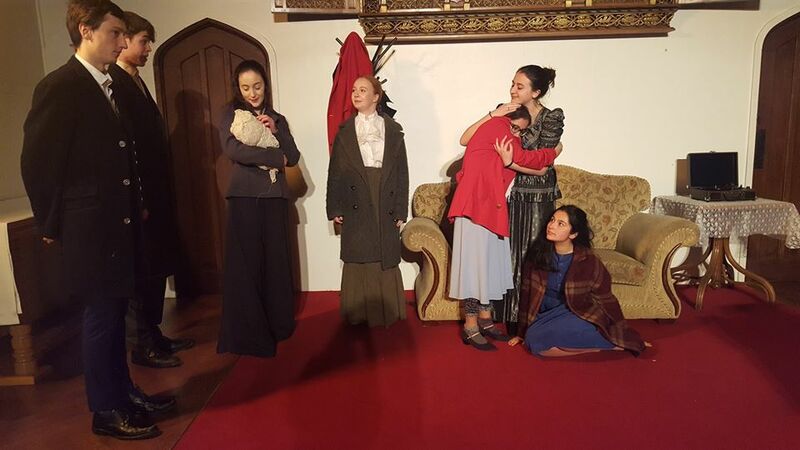 The production of Ibsen’s classic A Doll’s House was thoughtfully devised and well acted. Held at St Chad’s Chapel, it was a joy to experience such emotional tension and great performances. The setting in the church highlighted the moral tones that the characters experience, and the simple set design helped to focus the performance on the actors themselves. I had not read the play before, so it was a joy to experience it for the first time. Katie Cervenak shines in her role as the undermined Nora. She does well to balance the duality of Nora’s character as flighty and passionate, making us believe that Nora is shallow before flipping the switch and showing us hints of what she could really achieve. Nora’s courage is present throughout the play, intertwined with her superficial worries, and Cervenak balances these qualities very well. Her final speech towards Torvald was spoken with such conviction, and I was impressed at how well Cervenak fit into the role. Accompanied by Ben Chennells as Torvald, he does well to present a loving image which is shattered through his demeaning ways. Chennells did especially well to savour the silence at the end of the play, as if Torvald is really reflecting about the now realised impact of Nora’s absence. His sudden mood changes towards Nora are also well acted, flipping from raging to soothing and apologetic. He serves as a great counterpoint to Nora, serving to emphasise her superficial ways and his dominance over her. Supporting players Molly Goetzee, Kyle Kirkpatrick and Matthew Chalmers were all great as Mrs Linde, Dr Rank and Nils Krogstad respectively. Goetzee plays a fantastic Linde, making her a character you trust almost immediately. Kirkpatrick makes you feel the helplessness and depression of Dr Rank, at the mercy of his mortality and at Nora. I feel as though Chalmers could have leant a little more into the role of Krogstad – I would have liked to have been more creeped out by him. That being said, he makes up for it with the true desperation that Krogstad feels for his position in life, and you can see why Nora would be frightened of him. Overall, all performers did very well to bring the characters to life, flaws and all. I do think that more time could have been taken to pause and really feel the silences – sometimes actors rushed through lines (such as when Torvald asks Nora to shake his hand), however this is only a minor quibble. This play proves the necessity of feminism, and the recognition of human equality – for only £5 pounds, this adaption is worth seeing.